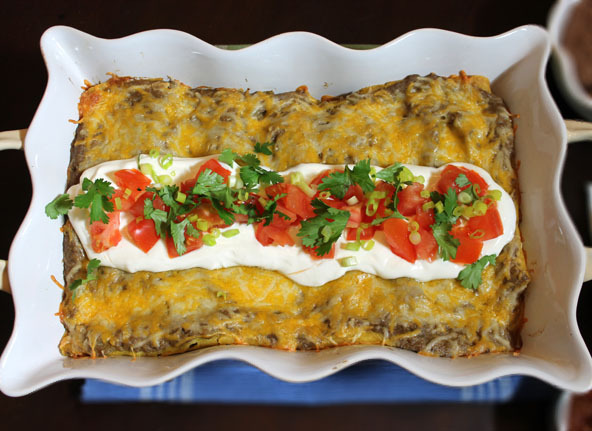 Finally a healthy Enchilada recipe without one of the worse processed canned foods Americans have ignorantly used in so many dishes for so many years. Yep, condensed cream of mushroom soup. I used my Wholetarian replacement recipe for “Condensed Cream of Mushroom Soup”, added some fire roasted diced green chilies and managed to create some “mighty fine” tasting Enchiladas. Not only is this version of condensed cream of mushroom soup delicious it is made without flour of any kind making it Gluten-free as well. What do I use instead? Vegetables. Yea, any no one can even tell. They just know it tastes good and that’s all they care about. Sure I miss the convenience of opening a can and dumping it into a recipe for a quick fix meal but my family’s health is at stake here and I think they are worth the extra effort now and again. I don’t need to make this dish as much as I used to but every once and a while I still get the request from my kids for old time sake. This can be easily made into a Vegetarian version by substituting the meat with white northern or navy beans and frozen or fresh corn. I use a pressure cooker to get the job done fast. Put 1-2 Tbsp of coconut oil in the bottom of the pressure cooker. Heat the pressure cooker pan to medium/high. Cut the raw chicken breasts into about 3” pieces and add them to the pan to sear. Turn over on other side and lightly brown on both sides. Add about ⅓ cup of filtered water to the pan and seal the lid on. My pressure cooker is a Kuhn Rikon which has two red rings, and I cook it at the second ring for about 8-10 minutes but you’ll have to follow your pressure cookers instructions. Remove pressure cooker from the heat and let it cool down slowly as you prepare the sauce for this recipe. You can remove the lid once it has cooled down and you are ready to shred the chicken. This sauce is the same as my “Condensed Cream of Mushroom Superfood Soup” recipe with just the addition of diced green chilies. In a medium size pot over medium heat, add the coconut oil and chopped onion. Sauté for 3-4 minutes and then turn heat to low for an additional 4-5 minutes with the lid on. Don’t rush this part as you want the onions to turn soft without burning them. Taste to see if you think it needs more sea salt and pepper. Add the cooked, shredded chicken to the mushroom sauce. Stir in the diced green chilies along with 1 cup of cheese. Save the other cup of cheese for the topping. Heat a skillet or pan to medium/high heat with 1 Tbsp at a time of coconut oil. Place the tortilla in the pan until softened and turn over to soften on the other side. Do not let it cook too long or it will get too stiff to wrap. Remove from pan and place on a plate to cool. When you can handle them with your hands, place a scoop of the chicken & sauce filling on a tortilla. 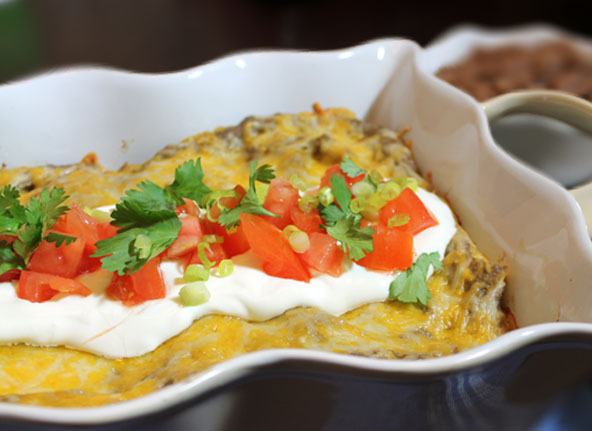 Wrap the tortilla around the filling and place in a casserole dish with the seam down. Continue filling and placing the tortillas on every inch of the pan. My pan is deep enough to put two layers of enchiladas on top of each other. Spread a layer of sauce over the top. Sprinkle the remaining cup of cheese on top. Bake in the oven at 350 for 20-25 minutes or until the cheese is melted but not browned. Remove from the oven and just before serving top with sour cream, chopped tomatoes, chopped cilantro, and chopped green onions. 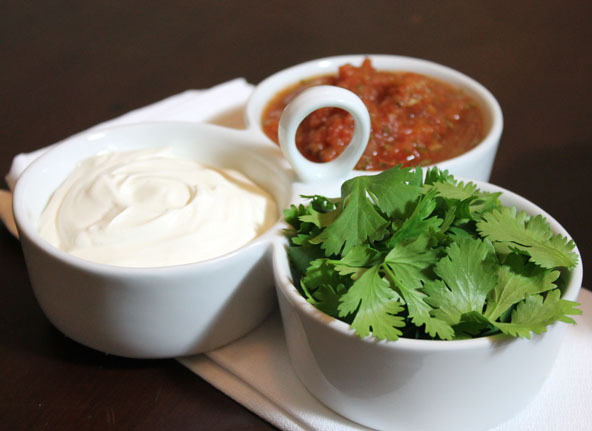 Serve with Salsa and re-fried beans. Blending all of the mushroom is the most kid-friendly without the chunks of mushrooms and the easiest method. However it has a little grayish color (due to the blended mushrooms) and some people prefer having delicious small chunks of mushrooms. Dice the remainder 4 oz of the mushrooms in tiny pieces and lightly sauté them separately in a Tbsp of coconut oil or ghee for 2-3 minutes. Either way this sauce is delicious and oh so good for you.